This has been an interesting project over the weekend. I have been working with penepma16 using the REFLIN parameter to stop a simulation when it reaches a desired tolerance (relative uncertainty). The key problem I encountered is finding suitable tolerance value that will be reached in a reasonable simulation time. I simulated a simple example of a 100 nm Al film on Fe at 20 kV using the Fe K-L3 line for the REFLIN parameter. This is a long simulation because of the deep penetration of the electron beam into the Fe substrate at 20 kV. My objective was to be able to predict the simulation time based on the tolerance criterion. I set up the simulation with a dump time of 120 sec. I wrote a function in R to read the penepma-res.dat file that is produced and extract the simulation time, the number of showers (trajectories) and the current value for the tolerance (relative uncertainty). I (manually) recorded the tolerance value after each dump time and stored the data file for later modeling. It ran for 2.7 hrs to get just over 25000 trajectories. It turns out that one can predict the time to reach a given relative uncertainty (tolerance) by fitting the data to a model where the simulation time in sec is fit to (1/tolerance)^2 (see the attached plot). The coefficient for this transition was 384.5 with a standard error of 1.068. Running the simulation to a tolerance of 0.2 required 2.7 hrs. Running the simulation to a tolerance of 0.05 would require 42.7 hrs! I suspect that the time to reach a given tolerance would be lower for measurements at lower accelerating voltages because each trajectory would be shorter. This is a work-in-progress. The function call will fail if penepma is writing the penepma-res.dat file at the time the query is made. I am still figuring out how to automatically run the query in a loop and write the results to a file for later analysis. I'm curious if anyone knows whether or not this problem could also be solved via a GPU platform. My understanding is that they're great when you have the same starting data but not necessarily efficient if you have to keep loading in new operations, and I don't know enough about how these things are calculated to even make a guess as to whether or not it would be useful to look in to. Any thoughts? I've done a bit of spot reading, and it looks like if enough data can be loaded into the initial set (eg you're not constantly sending and retrieving the data through the PCIe bus) and the process is parallelizable it *might* work. Of course, might also be cheaper to just rent some Amazon EC2 time and do several days of computing in an hour. Neko, I suspect a port to use a GPU would be a major undertaking. The base penelope/penepma code only uses a single core. There is a provision for using different random number seeds, running multiple simulations on different cores and combining the results. There is also a multi-core version developed by Oak Ridge National Laboratories. I understand that there are differences in input because of this. I have not heard any one on this forum claim to use it. My main purpose in running the experiment to understand how the required simulation time varied with the desired precision was to get an idea how to manage an uncertainty budget in an analysis and to be able to predict how long a simulation with a desired uncertainty would take based on a trial simulation. More of my effort has been dedicated to designing a R package to automate analysis of the output and make it easier to write a reproducible report. I found myself repeatedly writing similar code, which is a key sign that one needs to package functions under version control and use unit tests. This was because I had assumed the room temperature densities for calculating the material files for these gaseous elements (if we had evolved on Pluto this would not have been an issue!). The gaseous densities (~10^-3) were problematic because the default "bulk" geometry file (bulk.geo), specifies a thickness of only 0.1 cm or 1 mm. This makes these gaseous pure elements essentially a thin film experiment where some of the incident electrons actually transmit through the specimen geometry resulting in too low a generated x-ray intensity! Our solution was to simply force the pure gaseous element densities to 1.0 if they were less than 1.0. Obviously you can modify the densities from the GUI to whatever values you want and re-calculate them, and/or edit the bulk.geo file geometry, if you prefer. and run the installer manually once. 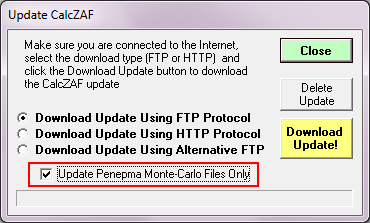 After this, you can continue to update CalcZAF and/or Probe for EPMA from the Help | Update menu again. Or you can manually download the Penepma12.zip file from the various download sites if you prefer and unzip it to your user data folder (usually C:\UserData\Penepma12). The actual pure element PAR files are in the \Penfluor\Pure sub folder. 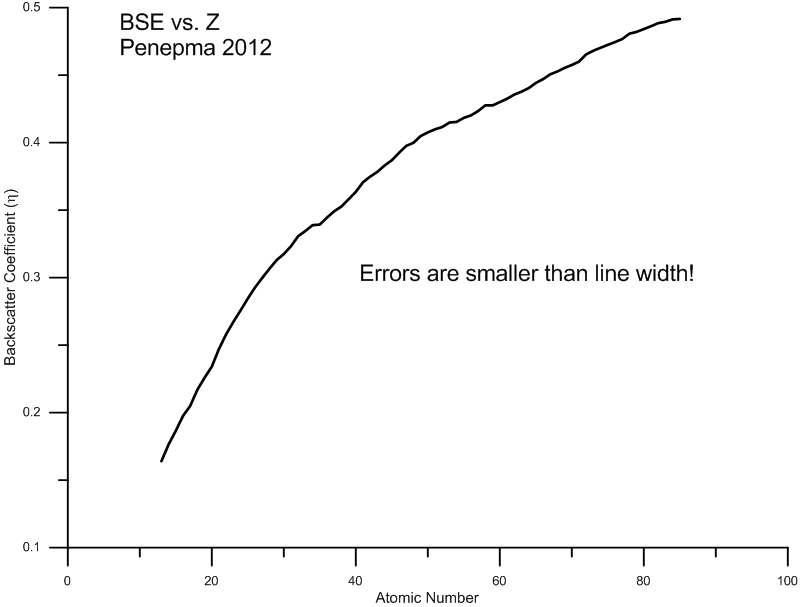 Attached is a plot of some BSE simulations I did recently for pure elements in Penepma (Penelope) 2012 (please login to see attachments). 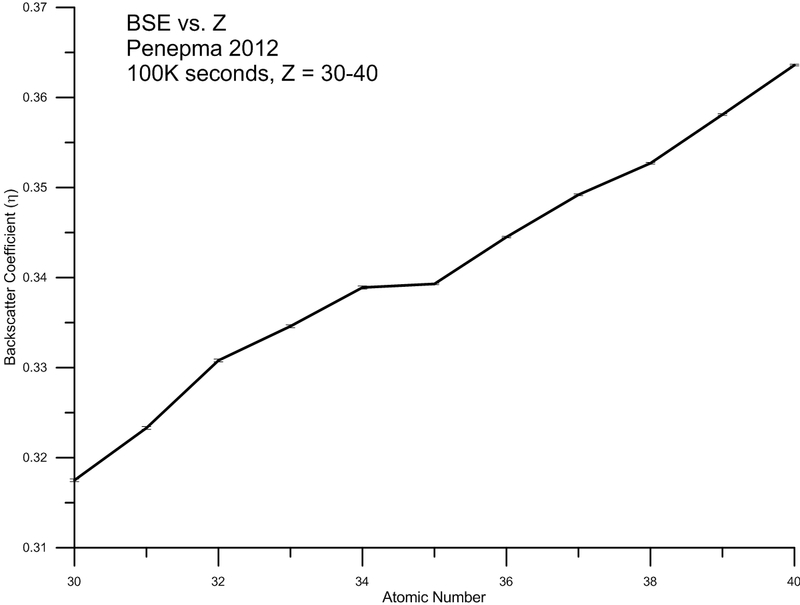 My question is: are these BSE fluctuations for these pure elements, e.g., around Z = 35 or so, we are seeing in the Penepma calculations, confirmed by empirical measurements? What I mean, is there a physical basis for these BSE fluctuations in the Penepma modeling? Or is it an artifact of the elastic scatter modeling in Penepma? I asked Xavier Llovet and he said: good question! As he also pointed out, it would be difficult to get enough sensitivity to see this empirically, but I might give it a try. Does anyone have any thoughts on whether this is just a modeling artifact? Has any one tried to see this with other MC software? At that time I asked if anyone had noticed whether any other MC software packages show the same discontinuous trends (e.g., around Z=35), for the pure elements. The variances are shown as the tiny errors bars. So at least Penepma is consistent. But why these discontinuities occur, for example between Se (34) and Br (35), I have no idea. Yeah, it does make sense in my head at least - this is what I was thinking about back in August on the brain teaser thread (assuming I'm right, of course - something which should never be assumed!). Link to the brain teaser thread:https://probesoftware.com/smf/index.php?topic=1111.msg7468#msg7468. To paraphrase Goldstein et al*, the elastic scattering events that combine to form the BSE emission result from an interaction of the primary electron beam with the electrical field of an atom i.e. the positive nuclear charge of an atom as shielded by the electron cloud. It is this effect of the electron shielding that I think you are seeing here. I've pulled some numbers off the web for the effective nuclear charge at the valence shell (which shell is valence? discussed briefly below) and plotted these up in the attached images - I hope you agree the plot for the effective nuclear charge, Zeff, as a function of atomic number for the elements Z= 30 to 40 looks similar to the plot of BSE coefficient vs Z. What I haven't figured out is why it appears to be offset by 1 compared to your data? Further to this, the filling of the subshells in the lanthanide series also unusual: the electron configurations of Cs and Ba are as expected [Xe].6s1 and [Xe].6s2; but La skips the 4f subshell and starts filling up the higher energy 5d subshell [Xe].5d1.6s2; Ce starts filling up the 4f subshell [Xe].4f1.5d1.6s2; and then Pr dumps the 5d subshell and moves the electron in to the 4f to get [Xe].4f3.6s2 (no 5d electrons). I think all the wobbles and fluctuations you see through the BSE vs Z model that has been posted are mostly caused by these electron subshell filling/nuclear screening artefacts. If so, I'm actually quite impressed that the MC simulations show it. First of all the BSE brain teaser that Ben and you and I were discussing is a slightly different issue (in my mind anyway), as that is more related I think to how one should calculate average Z for compounds. Hence the Z fraction to the 0.7 exponent model. The value of 0.7 for the exponent is necessary to calculate the effect of nuclear screening by inner orbitals in higher atomic number elements (it's why the BSE coefficient tends to increase less as Z increases). That and the fact that the number of neutrons tends to increase faster than the number of electrons and protons as the atomic number increases is why using mass fraction skews the average zbar calculation at higher atomic numbers. See a plot of A/Z for the periodic table and it will make sense. If it wasn't for this nuclear screening, we could just use a simple z fraction for compounds. By the way, if you'd like to compare a number of average Z calculations, simply check the Calculate Alternative Zbars in the Output menu of the Standard application. Attached below is the complete Excel spreadsheet with the Penepma pure element values. First of all the BSE brain teaser that Ben and you and I were discussing is a slightly different issue (in my mind anyway), as that is more related I think to how one should calculate average Z for compounds. Yeah, I realised at the time that I'd wandered off on a tangent. The thing that got me started there wasn't the average atomic number, but rather why were we using the atomic number at all - integer values always seem a bit too convenient! That said, trying to determine the average Z[eff] to account for bonded atoms in an unknown material might be challenging! The value of 0.7 for the exponent is necessary to calculate the effect of nuclear screening by inner orbitals in higher atomic number elements (it's why the BSE coefficient tends to increase less as Z increases). I assume this is in addition to the decreasing proportional effect of adding one more proton to the nucleus e.g. adding 1 proton to H will double the proton number, add 1 proton to La makes less of a proportional difference (1/57)? That is strange - I'm wondering whether we're looking at a spatial effect as well as a screening effect ie the probability of where the primary beam electron would interact with the atom and whether this occurs between shells or is considered only outside of the atom (and hence would experience the complete shielding effect as seen by the valence shell). Or whether the numbers either penepma - or more likely I - used are wrong - there was a bit of variation in the numbers I found..